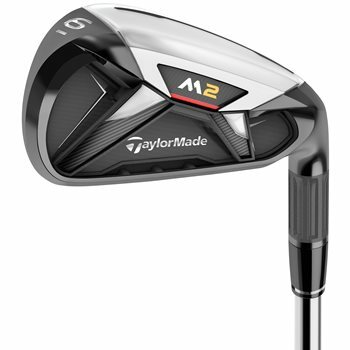 The TaylorMade M2 iron set features materials and technologies that combine metalwood like launch conditions with class leading shot height for maximum distance. The large, unsupported, thin face and new Speed Pocket allow ball speeds that push the limits of distance performance in an iron. By employing weight saving technology like the L shaped toe design, 360° undercut and the new thick-thin fluted hosel, the ultra-low CG gives the ability to utilize stronger lofts without sacrificing peak trajectory and playability. The M2 also features a new V-shaped badge that provides great sound, while dampening unwanted vibrations for excellent feel. Review by Tim , 2 years ago. Review by Brennan, 2 years ago. Review by Kramer, 8 months ago. Review by ZR, 1 year ago. Review by FORE, 1 year ago. Unfortunately the sets are sold just as they are listed. The sets are pre-boxed and we ship from multiple locations. We also could have more than one of the same exact item. Our shipping department will simply pick the item on top and process the shipment. it seems your prices are out of line. any clubs other than bargain or very good are close to "new" prices. What gives ? These are the 2016 M2s. Is there anyway to see an actual picture of the clubs? Unfortunately, due to the size of our inventory and multiple shipping locations, we are unable to provide pictures of a specific set of clubs. Could you give me some additional details on the condition of the clubs? Unfortunately, due to multiple shipping locations and the size of our inventory, we are unable to provide specifics about a specific set of clubs. the condition rating will give you a good idea as to what to expect. Is it posible to buy an AW for this set? What discount applies to this set of clubs. I would like to trade in,but I'm afraid the clubs I want will be gone. Are these the 2017 or 2016 M2 irons? and could i see a picture of the irons before buying them?